Per his military service record (regimental no. 4759), Harold Brooks Davis was born at Parramatta, N.S.W. He gave his age as 18 years [though he was much younger than this], his marital status as single, and his occupation as plumber. His description on his medical was height 5 feet 7 inches tall, weight 100 lbs., with a dark complexion, grey eyes, and dark brown hair. His religious denomination was Methodist. He claimed that he had no previous military service. It is not certain where Harold Brooks Davis joined the Coo-ee March. His “Joined on” date on his attestation paper was the 8th November 1915, the day the Coo-ees travelled from Lawson to Springwood. The Blue Mountain Echo reported that ‘he joined the “Coo-ees” in their memorable march o’er the Mountains’. The Farmer and Settler reported that ‘a halt of only fifteen minutes was made at Leura, but two recruits joined’ following a recruiting address on 6th November 1915. The names of the two recruits who stepped forward at his home town of Leura were not reported in local newspapers at the time. However he did not complete his medical until three days later, on the 11th November 1915 at Ashfield, and he was attested at Ashfield on the 11th November 1915. The Coo-ees had a recruitment meeting and stayed in Ashfield at the Drill Hall on the night of 11th November 1915 – the last night of the march. On his embarkation roll his address at time of enrolment was Northcote Street, Leura, N.S.W., and his next of kin is listed as his father, J. [James] Davis, Northcote Street, Leura, N.S.W. Private Davis departed Sydney on the HMAT Star of England along with many of the Coo-ees on the 8th March 1916. He arrived in Egypt on the 11th April 1916. On the 19th April 1916 he transferred to the 45th Battalion in Egypt. On the 2nd June 1916 Private Davis left Alexandria aboard the transport Kinfauns Castle bound for France, arriving at Marseilles on the 8th June 1916. Private Davis served with the 45th Battalion through its first action at Fleurbaix, France in July 1916, then the Battle of the Somme around Poziers, Mouquet Farm, and Flers. On 5th January 1917 the 45th Battalion was at Dernacourt, France, preparing to move forward into the front lines, when Private Davis was evacuated to the Anzac Rest Station with a Septic Foot. He remained at the Rest Station until 31st January 1917, when he rejoined the Battalion when it was at Mametz, France, resting and providing working parties behind the lines. Just three weeks later, on 21st February 1917 Private Davis received multiple gunshot wounds when the 45th Battalion was engaged in action at Gueudecourt, France. He was evacuated to the 45th Casualty Clearing Station. On 27th February 1917 he was evacuated by the 21st Hospital Train to the 6th General Hospital at Rouen, France, where he died of his wounds the next day, on 28th February 1917. Private Davis is buried in the St. Sever Cemetery Extension at Rouen, France. Private Davis’ name is commemorated on panel 139 on the Australian War Memorial First World War Roll of Honour. His age at time of death is recorded on the Australian War Memorial Roll of Honour database, and on his headstone, as being 16 years of age. His birth certificate shows that he was born on 1st March 1901, the son of James Davis and Elizabeth Davis (nee Brooks). This means that he had been only 14 years, 8 months, and 7 days old, when he joined the Coo-ee March. He was the youngest of the Coo-ees. Sadly, when he died of his wounds on 28th February 1917, he was still only 15 years old – this was the day before his 16th birthday. Private Davis’ name is also remembered on the Leura Lone Pine Park Memorial Gates. On 7th September 2014 Stephen and I drove to St. Sever Cemetery Extension at Rouen in France. 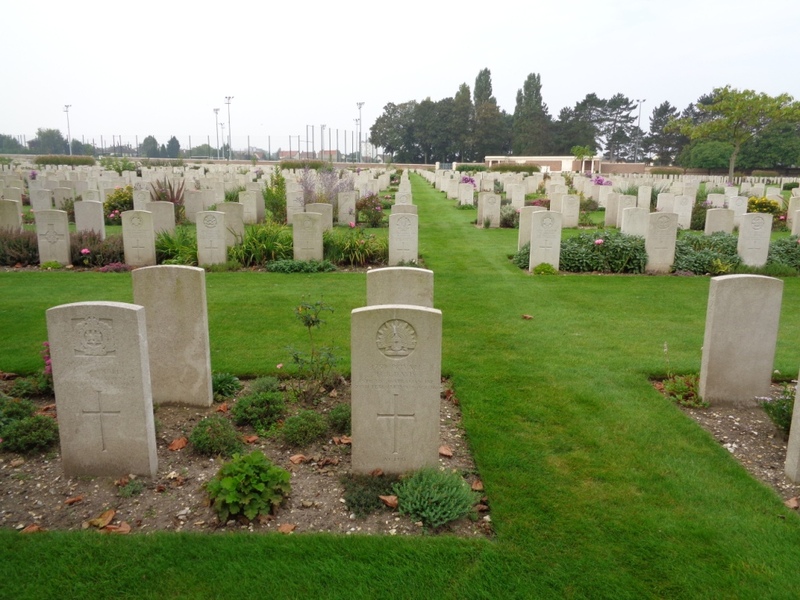 The majority of the soldiers that died at the Commonwealth camps and hospitals stationed at Rouen during the First World War were buried in the city cemetery of St. Server. A military extension was begun in September 1916, and the last burial took place in April 1920. There are 8,348 Commonwealth burials from the First World War in this very large cemetery. Harold Brooks Davis, a young plumber from Leura on enlistment per his service record, who joined the Coo-ees in the Blue Mountains, is the only Coo-ee buried in this cemetery. He died of wounds on 28th February 1917. The photograph below shows Private Davis’s headstone (centre) at St. Sever Cemetery Extension at Rouen. 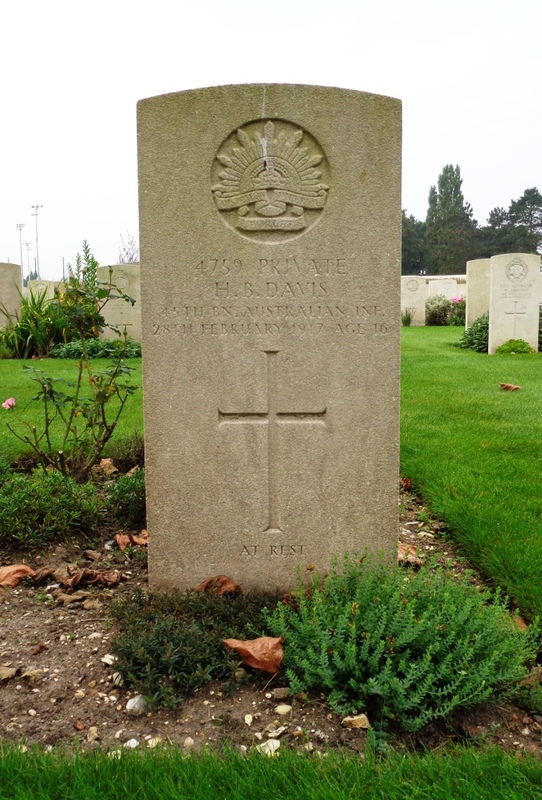 A photograph of the headstone on Private Davis’s grave will be placed on his individual blog entry, and form part of a Roll of Honour for the fallen Coo-ees on this blog.